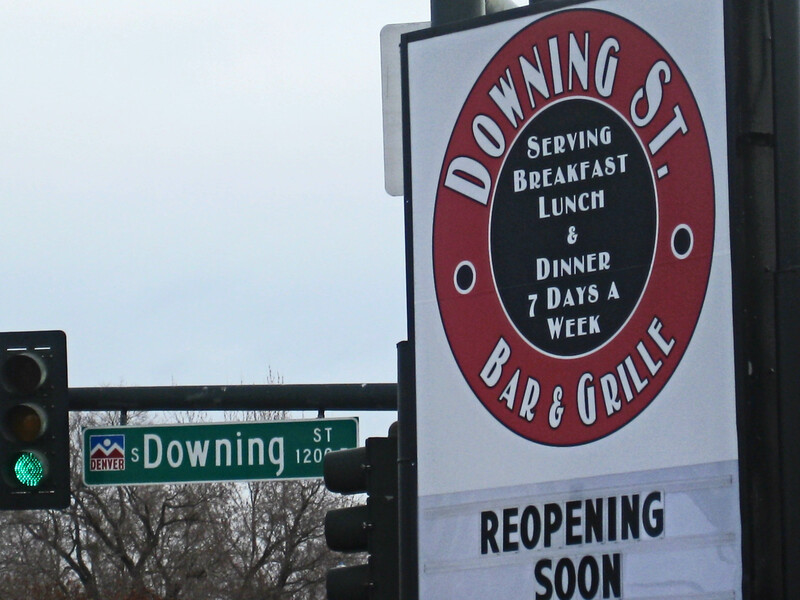 I’ve received a bunch of phone calls of folks looking to reach the Downing St. Bar & Grille. They are located at 305 S. Downing St and their phone number is 303-733-3923. I was their second customer (really wanted to be first) and stop by often for an awesome omelette or cold beer. Pam (the owner) is usually around in the mornings for the breakfast crowd and Paul (the owner) is usually always around for the evening crowd. They have some great food, beer and servers. They have some cool surprises in store, so stop by often. Give them a try if you haven’t already. BONUS: Breakfast is served ALL DAY!!! 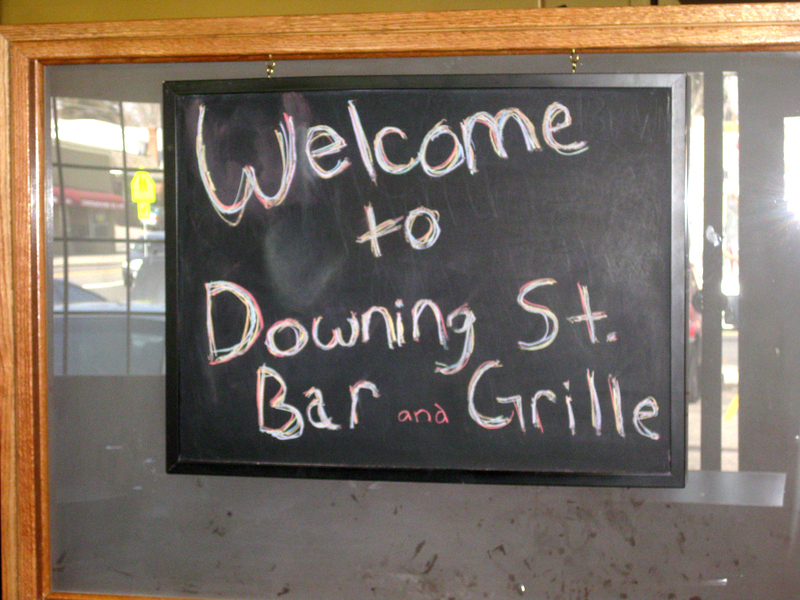 Downing St. Bar & Grille NOW OPEN!! I’m a few days late in this post and announcement of Downing St. Bar & Grilles opening. I’ve been in 3 times so far, for breakfast, lunch and dinner and am delighted with our new neighborhood restaurant hangout. Paul, the owner, is there all the time (much to his wife’s chagrin I’m sure) to meet, greet, welcome, chat with and bid good evening to his guests. 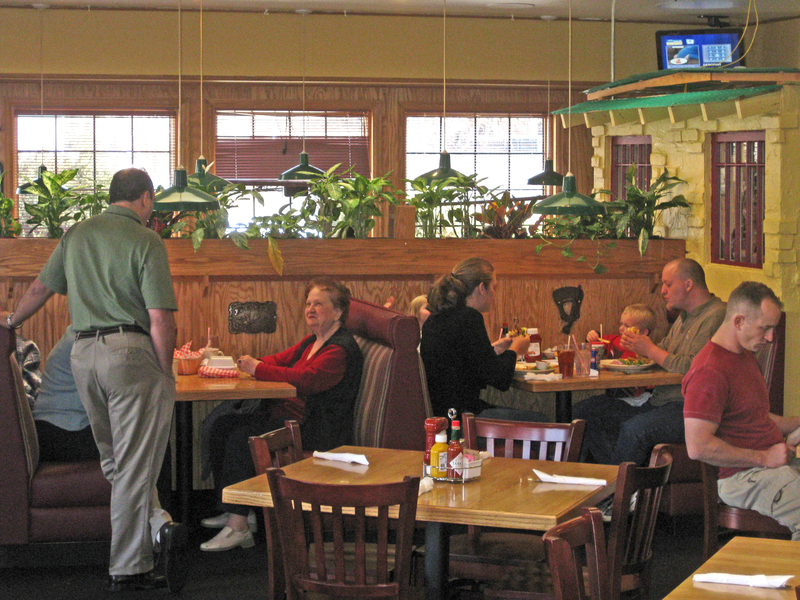 The wait staff is very pleasant and friendly and seem an asset to Paul’s high level of customer service and satisfaction . The menu is, at this time, a holdover from the Handlebar and Grill for lunch and dinner. The lunch and dinner menu will be revamped soon keeping about 70% of the HB&G’s menu items and adding some new ones. The breakfast menu has all the favorites from breakfast burritos and omelette to corned beef hash and eggs. The meal portions are generous indeed and quite a value for the money I’d say. My wife and I went in this past Friday night for dinner and had an excellent meal. She had the spinach salad and I had the fish tacos. We ended up hanging out in the bar area until 12:00 am chatting with Paul and a couple of his neighbors who were also there for dinner. There was a nice mix of patrons in the bar and restaurant and I was happy to see a number of families with young children in for dinner. 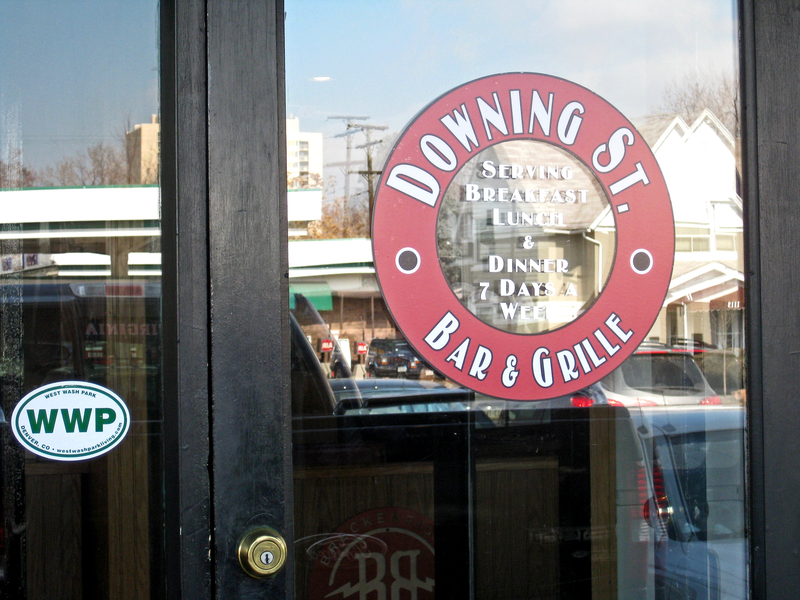 One thing I love about the Downing St. Bar & Grille is that they serve breakfast all day long. There’s nothing like an omelette for dinner I always say. 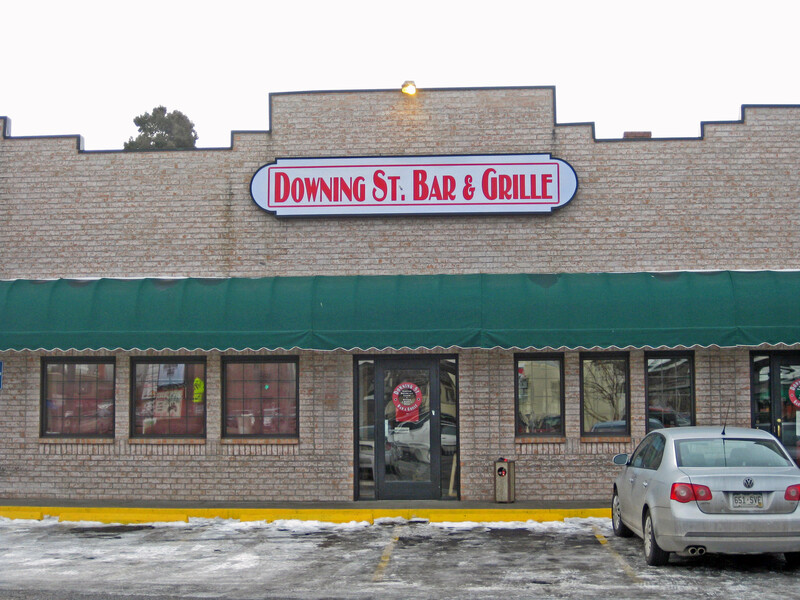 So if you’re looking for a comfortable gathering place for a delicious, well priced meal, with a great variety of choices that stays open until 2:00 am on the weekends, go over and say hello to Paul at the Downing St. Bar & Grille. WWP is abuzzzz with WASH PERK! They say 3 times a charm, and this is indeed the case for 853 E. Ohio Ave., the location which is now home to WASH PERK. I’ve seen 2 coffee shops come and go from this location, but will say in my humble, and coffee snobbish opinion, that WASH PERK is here to stay. Neighbors/ partners/ owners Teri Meehan and Debbi Main found the elusive magical formula that creates a beloved and lasting neighborhood coffee shop. Just ask the multitude of regulars that congregate at the community table or kick back in the cushy chairs or just grab their coffee to go from WASH PERK daily. I’m fortunate enough to live 2 blocks from WASH PERK and since opening the doors on April 1, 2008 I’ve seen this welcomed neighborhood establishment come to life and flourish. With Teri and Debbi being the forward thinkers they are, the early success of WASH PERK and with the cooperation of On A Lark next door, there are already plans for an expansion of WASH PERK in the near future. This will make room for a larger coffee bar, more seating and a roomier space for folks meeting over a cup of coffee and scone to relax and enjoy. Check out their calender of events for some fun or educational event that may interest you or your kids. With a prime location just 3 blocks west of Wash Park on Ohio Ave, corner of S. Emerson St., anybody taking a stroll over to the park from WWP or walking the dog through the neighborhood should stop by and grab a cup to go. And of course it’s close enough for park goers to walk to for a coffee break . They have a great selection of baked goods (rotated daily), burritos, Quiche, bagels and gluten-free products to accompany their wide variety of hot, iced or specialty drinks. In this age of earth consciousness and awareness, WASH PERK makes every effort to minimize their footprint to our fragile planet. The partnering with local suppliers, listed below, is only the beginning of how WASH PERK takes their responsibility to our planets sustainability very seriously. I hope you will, like me, walk through the door of WASH PERK, breathe in the welcoming aroma of rich coffee and fresh-baked goods, feel the sincere ambiance created by the friendly staff and surroundings, hear the laughter and conversation of friends old and new, grab a seat, take a sip and say… I’m home. If there’s anything you’d like to share about WASH PERK, please leave a comment. Check back soon for a WWP blog special for WASH PERK! Kirk Hartshorn 720-244-5454 khartshorn@perryandco.com RIDE ON!